After a chilly weekend of rain we spent a cold, wet Monday preparing for the possibility of a frost or freeze. When the temperature at night is predicted to be in the mid-30s we get uneasy. 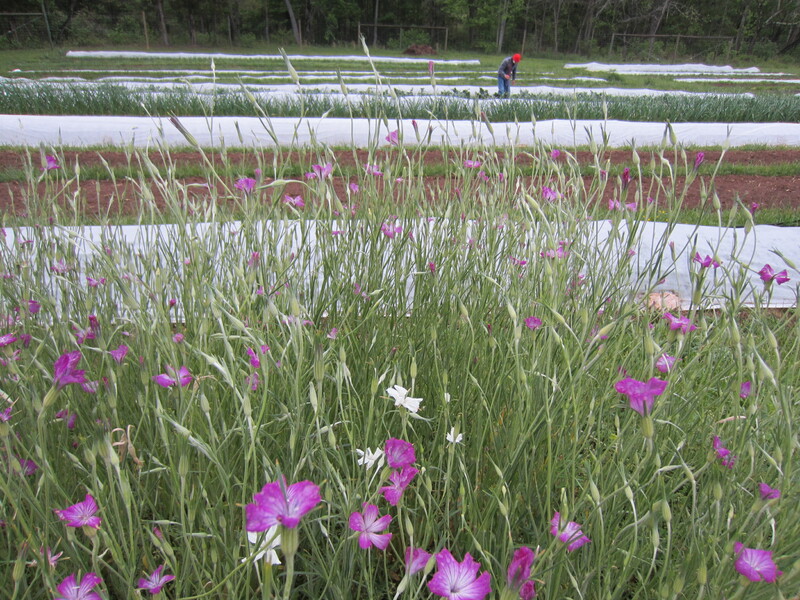 Our bottomland farm usually experiences weather a few degrees colder than the predictions. 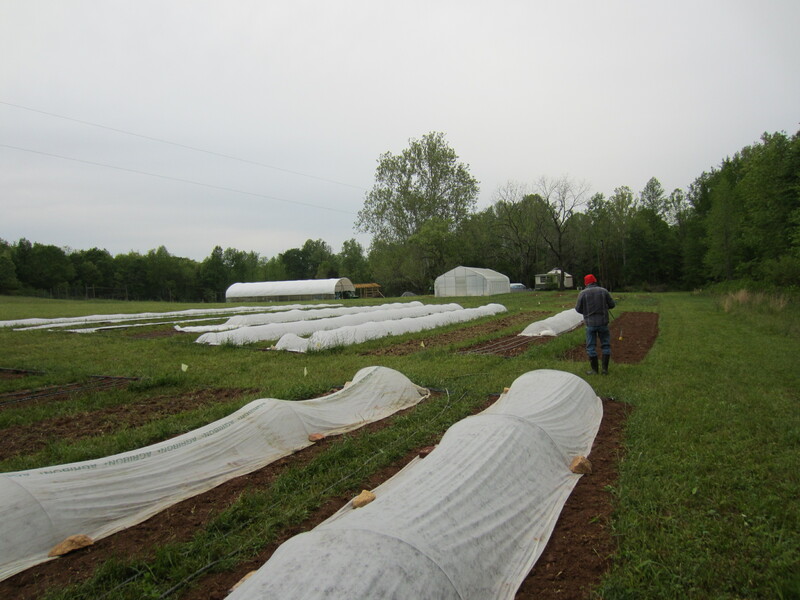 Megan and I spent many hours in the drizzle carting around wire, row cover, and boards (the only remaining available weights to hold down the row cover) to try to cover and protect as many of the newly planted tender crops as we could. But we could not possibly have covered everything. Some crops are too big already… I hate to spend so much time covering/uncovering, but it is the only option unless we want to risk losing all the hard work that has gone into a crop already. This morning when we awoke to a low of 37 degrees we were pretty relieved. A quick walk around did not reveal any noticeable damage. But sometimes the damage does not show up until a day or so later. These are tender beans growing under row cover. 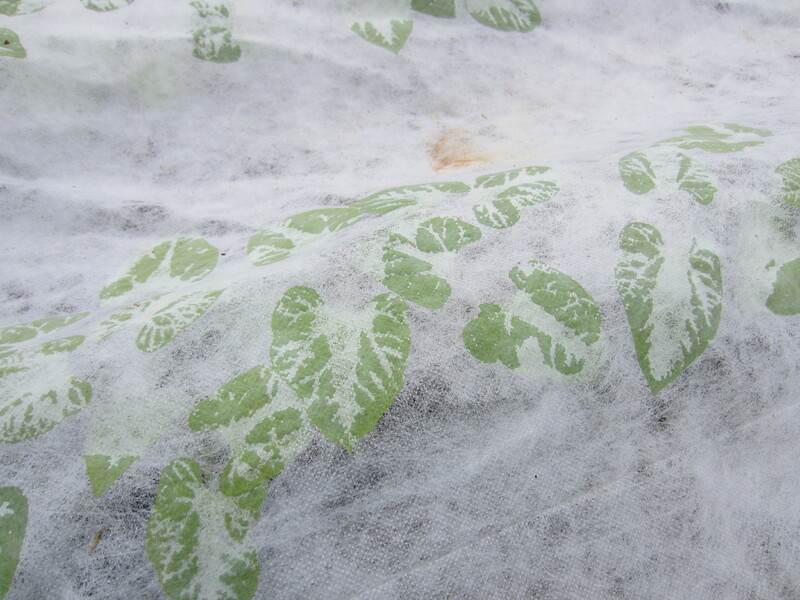 When it rains the wet row cover rests on the leaves, and if we had a freeze or frost the leaves in contact with the row cover would have been burned. Luckily it did not get that cold last night! We try to suspend the row cover off most crops with wire hoops, but we have so much under cover right now that we are out of hoops. We are looking forward to a time very soon when we will no longer have to worry about these chilly nights! Sure hope the freezing weather is about over. That is so much extra work. Glad Megan could be there to help you.